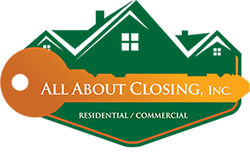 About | All About Closing, Inc.
We are All About Closing, Inc., the investor’s choice for all residential & commercial real estate closings. With over 100 years of combined experience, our team of highly skilled agents has the expertise and knowledge to ensure accuracy, efficacy, & compliant closings. Offering only the highest quality service, turnaround times, & standards in the industry. Based out of the beautiful, beach side city of Fort Lauderdale, established in 2012. As a real estate investor and small business owner, the level of service All About Closing provides to myself and my company is unrivaled. Due to the nature of my business, we have a high turnover rate and as a result we are always juggling multiple files, sellers, and buyers at the same time. The team at All About Closing is able to tackle our workload with ease and they anticipate potential hurdles to do everything in their power to ensure that our closings go smoothly. They are true professionals that are also fantastic at relating to myself and my team on a personal level and it is a pleasure to work alongside them daily. I wholeheartedly recommend them for everything from traditional closings to specialized investor services. The experienced and charismatic group of professionals at All About Closing are able to make a purchase or sale effortless. They are well connected with others working in the Florida real estate market. A true pleasure to do business with.